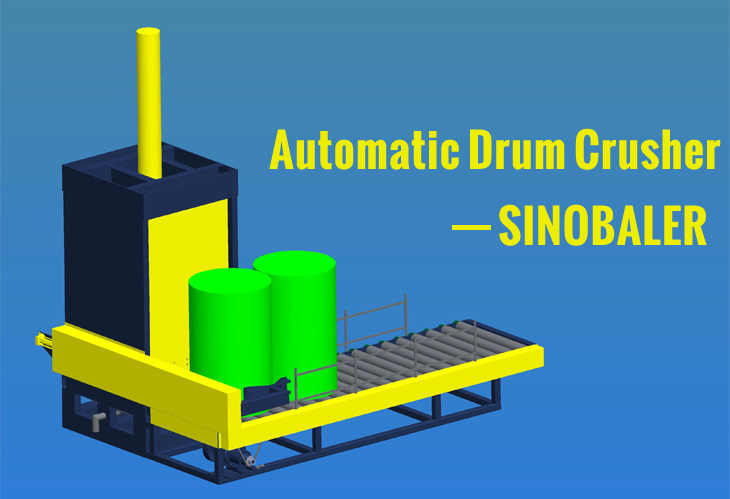 Automatic Drum Crusher ( also called auto barrel crusher ) is a newly developed baling machine designed by SINOBALER engineering team. It is designated for crushing or flattening metal container/drum/barrel up to 58 gallon or 220 Liter size. Compared to traditional Drum Crusher which requires operator to manually load drum or barrel into baling machine and then discharge the crushed one. This automatic baling press machine is equipped with a rolling conveyor and a hydraulic driven “arm” which automatically loads drums into the compressing chamber for compression, and the flattened drum will then be automatically ejected. Automatic drum crusher (also called barrel flattener ) which greatly helps in promoting work efficiency and cutting labor cost, is designed to set new standards in the industry. This hydraulic baling press machine is especially suitable for facilities that have large volume of drums to be crushed every day. If you are looking to flatten metal drums/barrels in a simplified and efficient manner, this auto feeding drum crusher is the right way to go. To know more about this baler machine, just drop an email to sinobaler at info@sinobaler.com or Inquiry for automatic drum crushers!